Over 100 innovation projects will be presented at the Abu Dhabi Corniche as part of activities to mark the UAE Innovation Month in February. The Abu Dhabi Department of Education and Knowledge (Adek) on Monday unveiled Abu Dhabi's initiatives and activities to mark the UAE Innovation Month, which is intended to promote the culture of creative thinking among young people. The initiatives include Innovator 2018, a significant platform for innovators and the Abu Dhabi Science Festival, one of the largest annual science festivals in the region. The event will involve 25 innovations and 33 interactive workshops in Abu Dhabi and the Al Ain regions. Set to launch in Abu Dhabi on February 1, the month-long innovation festival will involve government entities, small businesses, multinationals and education bodies, aimed at promoting the UAE as a hub for creative thinking. 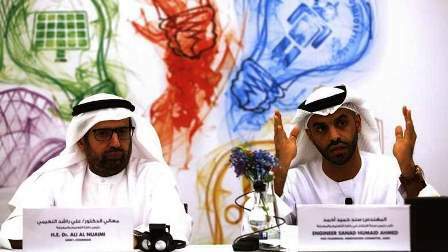 Dr Ali Al Nuaimi, Chairman of Adek, said at a Press conference that the UAE's leadership has always encouraged innovation and excellence across all fields, highlighting the vision and directives of His Highness Sheikh Mohammed bin Rashid Al Maktoum, Vice-President and Prime Minister of the UAE and Ruler of Dubai, to extend the UAE Innovation Week to the UAE Innovation Month as a testament to the efforts of attracting the best innovators and innovations on a national level. "The UAE is keen on promoting innovation and creative thinking among people because it is considered critical to helping the country diversify its economy and further cement its position as a global inspiration," said Al Nuaimi. "We want to create a culture of innovation and creative thinking among young people and parents. And the month-long activities across the UAE can help spread awareness about innovation." Sanad Humaid Ahmed, vice-chairman of Innovation Committee at Adek, said: "During the UAE Innovation Month, Adek will organise major strategic initiatives such as Innovator 2018, the Abu Dhabi Science Festival and a week-long interactive program as part of lema? in Abu Dhabi, Al Ain Region and Al Dhafra Region. "Program Your Idea" competition and Google Innovation Hub in Al Ain will contribute in creating a conducive environment to work, innovate and be distinct." In Abu Dhabi, the innovation month will involve over 100 innovators, 25 innovative projects from government and private organisations and 27 science workshops. Approximately 7,000 school students and 35,000 visitors are expected to attend the Abu Dhabi events while 600 students and 8,000 visitors are expected to attend six interactive workshops organised at three shopping malls in Al Ain. The lema? programme is expected to attract over 16,000 students in its various interactive activities. Innovator 2018 will be available for school students from 9am to 1pm and will be open to the general public from 4pm to 10pm on weekdays and 2pm to 10pm on weekends at the Abu Dhabi Corniche and three shopping malls at Al Ain from February 1 to 7, with free admissions for all.